Marketing your music online can take a lot of work. You have to find a way to cut through the noise and stand out from the crowd. That’s a tall order for anyone, even with the internet (the best marketing tool in current existence) at your fingertips. If hard work doesn’t turn you off, and persistence doesn’t give you a coronary, then you might find some useful tips on this list. However, it should be noted that the marketing activities mentioned here aren’t for the faint of heart. If the idea of losing a bit of sleep and putting more time towards your music career doesn’t scare you, let’s get going. 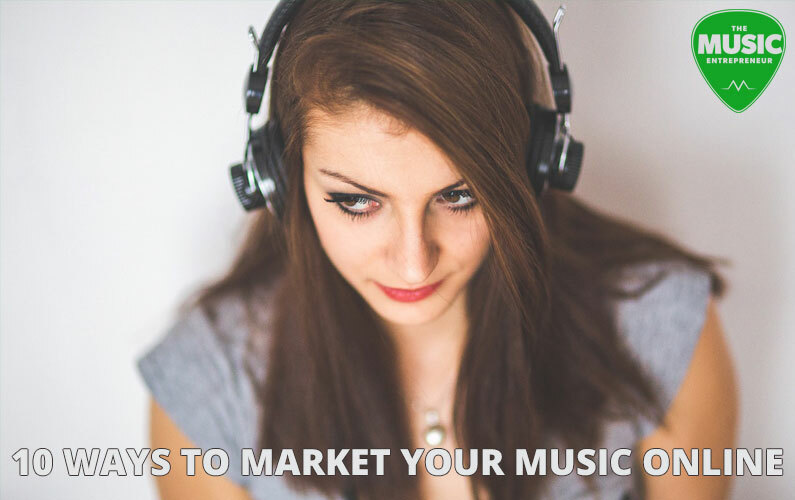 Here are 10 ways to market your music online. To me, this is the most important item on this list. When MySpace was still popular, musicians often used their profile as their home on the web. Today, there are many bands and artists doing the same thing on sites like Bandcamp and ReverbNation. I would heartily advise against this. While it is nice to know that there are sites where you can sell your music on your own terms or display your whole press kit on a single page, it doesn’t negate the need for your own home on the web. I’ve talked about this before, but it’s important to recognize that social media is rented space. You never know when the terms of service could change, and you also never know when a site could get bought out or shut down. If you buy a domain name and a hosting plan, you own it. It costs money, but as long as you keep up with the costs, you will always have a place on the web where your fans can find you. Plus, it just looks more professional when the first search result in Google for your artist or band name is your domain and not a social profile. There are no rules saying that you can’t have multiple websites. In fact, there may be a good reason to build out your online presence, especially if you have extra time and resources on your hands. If you have two or more sites, you can cross-promote projects, link up content between them, develop and sell different types of products (like an information product, perhaps?) for additional income, and send traffic back and forth between your two properties. Just don’t underestimate the amount of time and effort that it will take to do this. Enlist the help of your band mates for content creation, or ask your fans and see if they would be interested in helping you on this project. Managing and maintaining multiple sites is a lot of work, even for the experienced. If you find that you are easily sidetracked, then don’t build additional sites to support your main one. To me, focus is more important than spreading yourself out without an organized plan. Writing content on a regular basis isn’t exactly the easiest thing to do, but it is a great way to promote your music. It’s also good for search engine optimization purposes. The main thing is to have some kind of plan. You can use your blog to talk about random subjects whenever inspiration hits, but this isn’t terribly sustainable. A good topic to blog about would be bands or artists that you like, sound like, and music that has influenced you. That way, if your visitors do find you through search, they’ll get a sense of what you sound like too. Additionally, make sure that your blog is actually hosted on your website. Please don’t go and start a blog on Blogger or LiveJournal. It’s not the same thing, and it almost defeats the purpose of content writing completely. If you want to explore this subject in more detail, I have already written a lot about the subject. Check out The Ultimate Guide to Blogging as a Musician for starters. How do people find you on the web? Your primary fan base probably knows where your website is already, but how do you attract new fans? For SEO, authority, and backlinking purposes, guest posting is a really good strategy. Just in case, the technical definitions of the aforementioned terms doesn’t really matter right now. It’s about what it can do for your website’s traffic. Guest posting allows you to get in front of larger audiences, on sites where people are already interested in new music. It might take some research, and it would be effort-intensive, but the results should speak for themselves. I have a bit of a love-and-hate relationship with social media (especially with Facebook), and I would hate to see musicians invest all of their time and energy into it. However, there are far too many advantages for me to glance over it completely. Musicians are basically media creators. They utilize a variety of media types like photos, videos, audio, and sometimes blog posts to promote themselves and their music. Social networks are the perfect place to engage with this kind of content. Facebook, Twitter, Instagram, SoundCloud and other music-oriented networks like PureVolume might seem like the obvious places to hit, but don’t underestimate networks like LinkedIn, Pinterest, Google+, and Tumblr either. By the way, I know I beat this horse to death, but don’t just send generic “check this out” type messages out there. Take some time to strategize. Tell a story. Give people a reason to talk about and take interest in what you are doing. Video is a powerful form of media, as long as you keep it to about two to five minutes. In that sense, it’s perfectly suited to music (because most songs are in that range). I wouldn’t get too excited about making it big and making a lot of money on a site like YouTube, as the odds are pretty much against it, but you can definitely use the medium to connect with your fans in more direct and personal ways. A fortunate side benefit may include monetary rewards. Moreover, it’s media that you can share just about everywhere on the web, especially on a blog or on your social networks. If you’d like to extend your reach, it might be worth looking into a tool called OneLoad. Using OneLoad, you can distribute your videos to multiple sharing sites all at the same time. It does take a little bit of upfront setup work, but the fact that you can be seen in more places across the web is a good thing. I think you’d be silly not to collect email addresses and run email campaigns as a musician. Unless you have a full database of all of your fans’ contact information (including phone numbers and street addresses), email is the only form of direct communication you will ever have with them. In fact, I think email is far more important than social media. Whether you’re playing shows or sending people to your website, make sure to incentivize them to sign up for your list. A free giveaway tends to work pretty well. For example, you could take a photo of your fans at a show and ask them to sign up for your mailing list. Or you could give them a download code for signing up. I’m sure you can think of other things to give away. I think podcasting is a little under-utilized by musicians, but it’s actually a great way to build a presence and following in the iTunes market and reach a different demographic. Think of it this way: if your music is “paid content” on iTunes, then your podcast is your “free content”; the gateway to your music. Additionally, people might read a blog post or engage with a video for a few minutes, but with podcasts, people will often listen all the way through, regardless of length. You have a huge opportunity to embed your personality and music into people’s minds. Like blogging or guest posting, podcasting can be pretty labor-intensive; it all depends on how produced you want your show to be. If you use a format that doesn’t involve a lot of editing, you can publish content simply and quickly. On the other hand, if you want to use bumpers, listener questions, opening themes and other elements, your production increases in complexity, making it a bigger investment of time. If you want to podcast, remember to make a sustainable schedule for yourself. Don’t go overboard. As far as content goes, you could conduct interviews on your show, share marketing tips, showcase demos, play acoustic versions of your songs, and so on. It’s not a revolutionary concept at this point, but you could use a site like Livestream, Ustream, or even Google Hangouts to stream your live performances. You could broadcast from your bedroom or home studio, or even a coffeehouse or bar. You can use these opportunities to promote your website or product, blog or podcast, social networks, or anything else that you might want to direct your viewers to. In some cases, you can also record your performances and post them to YouTube or another video sharing site later. It’s a good idea to re-purpose content when you can. I view crowdfunding as the culmination of all of your online marketing efforts. Crowdfunding campaigns take a lot of work, but if you already have an email list, a blog, social networks, and other places where you can promote your campaign, you will have a much easier time making it work for you. It gives you a great excuse to engage your entire fan base, and you will also attract new fans in the process. However, you shouldn’t gamble on the likelihood that you will have a high number of new pledgers; you need to have realistic expectations for your campaign. Again, this list is for individuals that can see themselves investing considerably more time and energy into their online presence. Every activity requires ongoing maintenance and follow-through. You can’t expect to do something once and see huge benefits from it. Incidentally, I use every strategy on this list except for live event broadcasts. However, that doesn’t mean I haven’t thought of doing it.